The pilgrimage to Makkah (the hajj) is an obligation only for those who are physically and financially able to do so. 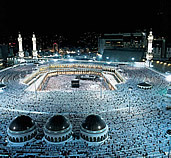 Nevertheless, over two million people go to Makkah each year from every corner of the globe providing a unique opportunity for those of different nations to meet one another. The annual hajj begins in the twelfth month of the Islamic year (which is lunar, not solar, so that hajj and Ramada-n fall sometimes in summer, sometimes in winter). Pilgrims wear special clothes: simple garments that strip away distinctions of class and culture, so that all stand equal before God. The rites of the hajj, which are of Abrahamic origin, include going around the Ka'bah seven times, and going seven times between the hills of Safa and Marwa as did Hagar (Hajir, Abraham's wife) during her search for water. The pilgrims later stand together on the wide plains of 'Arafat (a large expanse of desert outside Makkah) and join in prayer for God’s forgiveness, in what is often thought as a preview of the Day of Judgment.